We welcome all qualified divers. Divers with qualifications from other organisations, such as PADI or BSAC, will need to complete a cross-over to ScotSAC. The length of the cross-over course will depend on your previous diving experience. Previous experience diving in cold water using a dry suit is an advantage but we can provide training. There may be a waiting list for dry suit training. Please contact us to find out more. Kelvin Divers is a voluntary club part of the national Organisation ScotSAC. One of the benefits of learning to dive through a club like Kelvin Divers rather than a professional company is that once you have finished your training you have people to go diving with. We offer a try dive session so you can see whether you like scuba diving before you join the club. 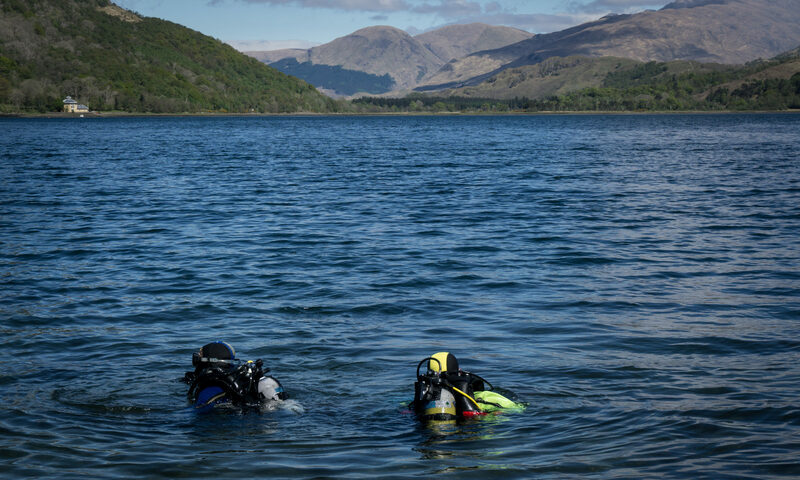 Scuba diving training with Kelvin Divers consists of a swim test, a series of pool training sessions and lectures and a theory test at Western Baths on Wednesday evenings followed by practical training in open water, usually in Loch Long and Loch Fyne. You don’t need your own diving kit as the club has a selection of diving equipment for use for free throughout your pool training (a lot of people, however, do prefer to buy their own mask after a few pool sessions). Once in open water there is an annual charge of £25 for unlimited use of club gear. The only additional cost during training is the cost to fill your air tanks during open water training (approx £5 per fill), the use of air during pool training is free. Unlike learning to dive through a professional company there is no tuition fee for learning to dive as the club works on a voluntary basis. To start training you have to be a member of both the Club and ScotSAC. For more details on pricing please see the Join page. Training is conducted 1 to 1 and can take between 3 to 12 months depending on individual and instructor’s availability. There is currently a waiting list for training but please contact us if you would like more information.